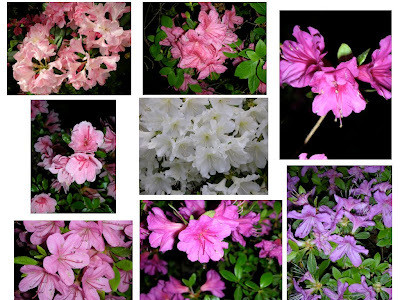 I don't promise that this is the last time I will mention the word azalea, or post a pic, but they are looking so phenomenal I put together this composite. They are all different plants and because these were in the yard when we bought The Cool House I have absolutely no idea of the names. It must be the combination of a mild winter this year on Long Island and a long, cool, rainy Spring that made the blossoms so abundant and so long-lasting. We've had a few real rainstorms and a lot of the plants have taken a beating in the past week but some of the pink and the white azaleas are still at their best, and the rhododendrons are just breaking out. If only we could get a few days of temperatures in the low 70s it would be perfect.